Sun., 9 Jun. - Fri., 11 Oct. Mon., 3 Jun. - Fri., 27 Sep. Thu., 31 Oct. - Fri., 15 Nov. Thu., 24 Oct. - Thu., 31 Oct.
Wed., 30 Oct. - Sun., 17 Nov. Tue., 12 Nov. - Fri., 22 Nov.
Wed., 4 Mar. - Wed., 18 Mar. Mon., 8 Jul. - Mon., 16 Sep. Thu., 5 Dec. - Sun., 8 Dec. Mon., 9 Sep. - Mon., 23 Sep. Tue., 29 Oct. - Thu., 28 Nov.
Wed., 2 Oct. - Mon., 7 Oct.
Fri., 18 Oct. - Mon., 18 Nov. Mon., 7 Oct. - Mon., 11 Nov. Tue., 15 Oct. - Tue., 29 Oct. Mon., 2 Sep. - Wed., 25 Sep. Sun., 1 Sep. - Mon., 16 Sep. Sun., 6 Oct. - Tue., 5 Nov. Tue., 4 Feb. - Tue., 25 Feb.
Wed., 30 Oct. - Mon., 11 Nov.
Wed., 21 Aug. - Sun., 10 Nov.
Wed., 12 Jun. - Wed., 19 Jun. Wed., 22 May - Thu., 20 Jun. Tue., 15 Oct. - Sun., 10 Nov. Sun., 16 Jun. - Sat., 29 Jun. Excellent hotel with pleasant service! Conveniently Located at the airport no taxi needed! Perfect room for one night stay before next flight. Clean, comfortable, quiet. Highly recommend, the customer service was excellent, very accomodating and welcoming. We travelled with small children and the staff were very onhand and helpful! Thanks a lot novotel will be staying with you again next time! Great hotel for the price, very convenient! Located close to the Airport, clean and comfortable rooms. Located in Northern Administrative Okrug, this hotel is within 6 mi (10 km) of Ezhi Monument, Mega Khimki Mall, and Church of the Nativity in Cherkizovo. Chayka Culture Palace and Dolls and People Theater are also within 9 mi (15 km). 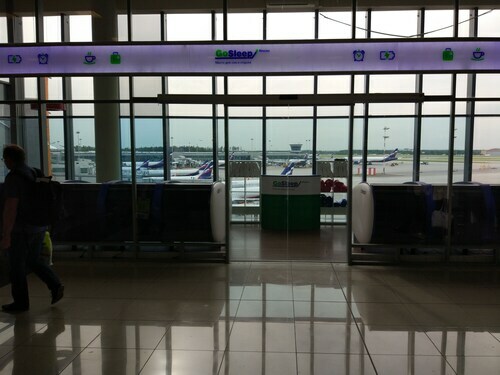 Khimki Sheremetyevo Aeroport Station is 5 minutes by foot. Located in Northern Administrative Okrug, this cabin is within 6 mi (10 km) of Ezhi Monument, Mega Khimki Mall, and Church of the Nativity in Cherkizovo. Chayka Culture Palace and Dolls and People Theater are also within 9 mi (15 km). 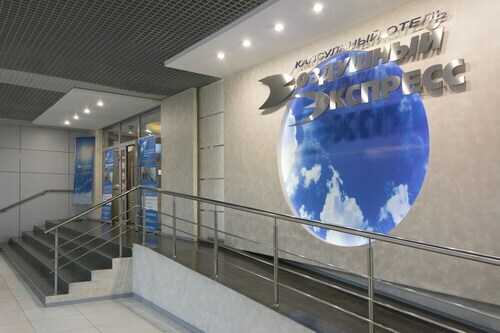 Khimki Sheremetyevo Aeroport Station is 12 minutes by foot. Question : How much is a plane ticket to Moscow (SVO) from Toronto (YYZ)? Answer : They range anywhere from $979 to $12,630. Booking in advance can usually help you get the cheapest ticket. However, usually the sooner you book, the better price you get. Question : What is the cheapest date to fly to Moscow? Answer : Tickets are currently $979, 51% less than the average price. As of Apr 22nd, the cheapest day to fly from Toronto to Moscow is Apr 25th. Question : What is the cheapest airline flying from Toronto to Moscow? Answer : Flight prices are hitting as high as $12,630 over the next three months when flying to SVO from YYZ. Check out American Airlines, as they have ticket reservations at just $979. Question : How much time do people spend in Moscow? Answer : The average time spent in Moscow by passengers from Toronto is 24 days. However long you decide to stay, give yourself plenty of time to see what makes Moscow fantastic. Answer : The cheapest day to fly from Toronto to Moscow is on Saturday. If you would like to save a little cash on your next getaway look for flights on Saturday. Question : Is there an alternative airport near Moscow? Answer : Yes! The other airport is Vnukovo Airport (VKO) which is just 26 miles away from SVO and on average, flights are 45% cheaper for the coming two months. Save a few bucks and put it towards your next trip.